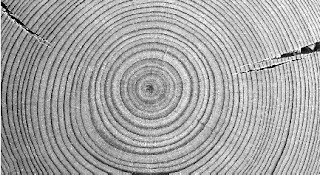 As you study the cross section of a tree, note that some annual rings are wider apart than others. When you see a wide space between the rings this means the tree grew faster at that time because it got more sunlight, water, and food. Lack of sunlight, food, water and competition with neighboring trees or being subjected to destructive forces such as forest fires, insects and disease, slow down the growth of the tree. The years marking slow growth show the rings closer together and narrow in width. As Don Richardson pointed out on last Saturday's hike, until a tree breaks through the canopy in a forest, it's rings will be very narrow and close together. Therefore, a tree in the forest that is say 12 inches in diameter could be a LOT older than a tree that is 12 inches in diameter in your front yard.